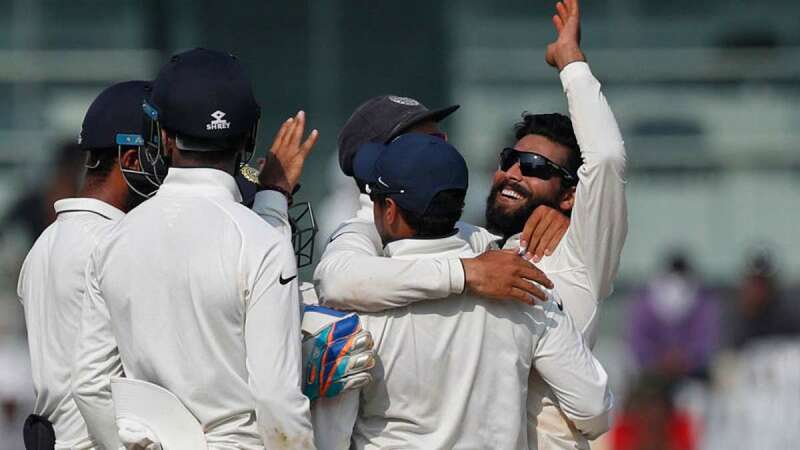 Chennai : Ravindra Jadeja shined on the last day of Chennai Test as India tasted brilliant 4-0 win against England in the five-match Test series. Jadeja took 7 wickets for just 48 runs on the last day to ensure team India’s victory by 75 runs and an inning. With this victory India has scored their best figures in Test wins, earlier it was 3-0 under Mohammed Azharuddin's captaincy in 1992-93. England started the day well, and it was looking like they will be able to save the game for themselves. Things changed after tea, when the visitor failed to save quick damages from Jadeja’s end. The England team lost their last six wickets for mere 15 runs. From 192 for four, the scoreline suddenly read 200 for eight, with plenty of overs left for Indian bowlers to wrap up the tail. The only disappointment for Jadeja came when he didn’t get man of the match trophy even with that figures. Karun Nair was conferred the title for his smashing triple ton.